Why Are Men Leaving The American Workforce? In the 1960s, men slowly but surely began leaving the workforce and many never came back. The trend continues today. Economists cite a number of reasons, from technology to international competition. It was a great time to be an American man in the workplace after World War II. Hiring was strong for both white-collar jobs and factory work while industries like autos, aviation and steel were booming. By the 1960s, that started to change. To describe this historic development with the context it deserves, we start with the American economy after World War II. It was firing on all cylinders, dominant globally, confident and dynamic. It was a great time to be an American man in the workplace. Hiring was strong for white-collar jobs and factory work. Industries like autos, aviation and steel were booming. 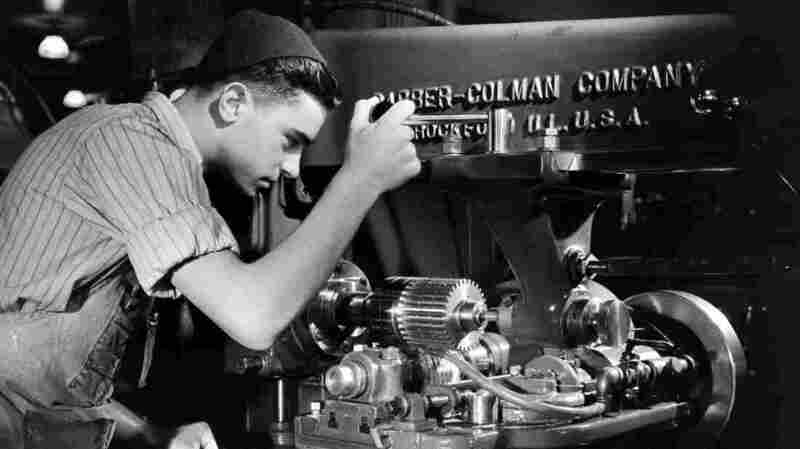 If you were a man in the 1950s, you had a job, says Nicholas Eberstadt, an economist with the American Enterprise Institute, a right-leaning think tank. And if you lost it, you started looking for another one. "If you weren't in the Army and you weren't in jail, you were very, very likely working, and there was probably a good reason for why you were not seeking work and not working if that was the case," Eberstadt says. But by the 1960s, that started to change. Men, slowly but surely, began leaving the workforce. If they couldn't find jobs, some simply stopped looking. And ever since, more and more men have been opting out of work. "We've been seeing this just long, decades-long decline in men's labor force participation," Shierholz says. Throughout the 1950s, the proportion of males over 16 who were working or looking for work held steady at around 85 percent, according to the Bureau of Labor Statistics. Then, in each successive decade, that number fell, tumbling all the way to 69 percent, where it is today. Some of that decline can be accounted for by benign factors such as men retiring earlier or young men staying in school longer. But if you strip away the students and the early retiring men, the picture doesn't change much. Men are still opting out. Back in the 1950s, just 3 percent of men in their prime working years (considered to be ages 25 to 54) were out of work and not seeking employment. Last year, that number was 12 percent. As more men have opted out of work, women have streamed into the labor force for several generations now. And at the same time, they have been obtaining more education. Women now receive 60 percent of all bachelor's degrees in the U.S.
David Autor, an economist at the Massachusetts Institute of Technology, says women have responded to an increasingly demanding job market by getting more education, but men haven't followed suit. "You might say, 'Why haven't men responded more effectively, why haven't they educated better, more, why haven't they moved into higher-wage occupations?' " Autor says. "And that is less clear." Autor says many service-sector jobs that remain — in restaurants and retail, for example — don't pay as well as the factory jobs that disappeared. And with so many men in the prime of life missing from the workforce, it can't help but take a toll on the economy, Eberstadt says. So what can be done? Certainly more education and better education would make a difference. But that's a profound, long-term challenge. Autor says there's one smaller fix that would help — expand the earned income tax credit. It's a subsidy that supports low-income workers when they find jobs and keep them. Right now, it primarily benefits women and children rather than single men.